Built with the same quality construction and components, the Fury is straight-up high performance. Different for Diamond on the Fury, its second channel A/B control has 2 different voicings. The Fury’s 2A channel has the raw aggression of its sister, the Phantom, 2B is a diode clipping gain structure that projects lush British-inspired, midrange heavy distortion like the Hammersmith. Back panel boasts a dialable "deep" control. And how about the Ferrari/Lamborghini inspired look? Starting at it’s carbon fibre covering, and continuing on to its unique yellow grill, the finest of Italian sports car logo style and even tach-inspired front panel, the Fury makes a distinct, high-end impression on first sight. But let’s not forget its most unique feature! Built in to the Fury is an MXR Smart Gate with dialable control on the back panel. For those that want high-gain and love a killer gate, take that pedal off your board because its now travelling on-board your amp. The Fury also features a real, correctly-designed effects loop. You don't need a foot switch; you don't have to push a button. Just plug a cable into the effects send and the loop activates. The loop is tube buffered and will not affect your tone. 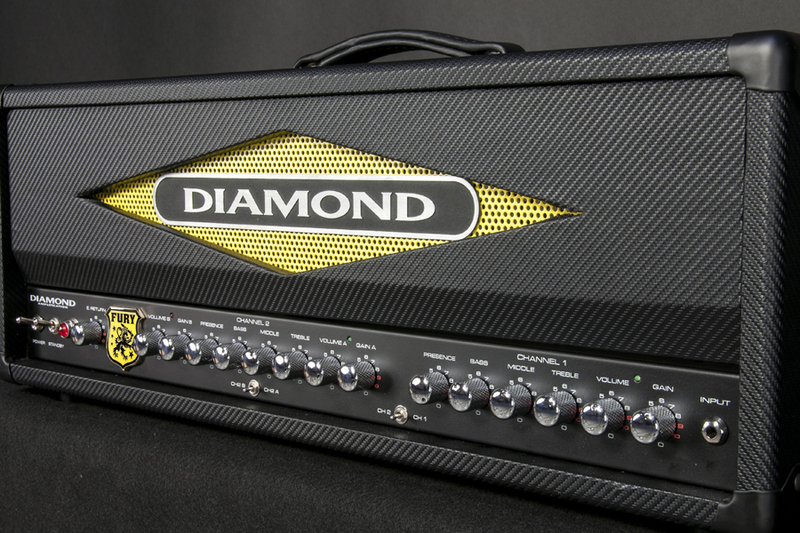 Like all current and future Diamond Amplification products, the Fury features the highest quality components and construction. Every component was selected and tested for this head. The Fury uses 6 12AX7 preamp tubes and 4 5881’s for its power stage. Each part was personally spec'd and tested by us to ensure maximum performance and reliability, from the transformers to the switches and knobs. All its channels are foot-switchable from the Fury's footswitch. Independent LED's indicate which volume/gain is active and whether the boost is engaged.